We've reached 2015! Happy new year! We had a cracking year, here's a little run down of our favourite bits! For the past few years we've been teaming up with other indie brands for the big Love Bomb! In January, we decided, rather than shoot models in the designers' lingerie, we'd shoot the designers themselves (apart from Curvy Couture who couldn't join us). For 6 days each brand ran a different offer or discount in the run up to Valentine's Day, and we all talked about what we loved about each brand. We started to launch our SS'14 collection, featuring the neon pink Nancy and peppermint green Penny sets! One of the most common pieces of feedback we get from our customers is the need for a wider range of sizes. As a small brand, with the cost of each different bra size being significant, we just aren't able to please everyone and create as many sizes as are requested. Our standard size set went up to 36DD, and the most common requests were for E and F cup sizes, so we took the plunge (no pun intended)! In February we launched the Lily collection, which included 32E, 32F, 34E and 34F sizes in both an open cup bra and a balconette bra. The feedback we received was amazing! The E and F cups almost completely sold out within a matter of weeks, which proved to us that the extended sizing was a good idea, and worth including in future sets. We have since re-stocked this line and included 36E and 36F cups also. Starting with our friends, Kiss Me Deadly, we launched guest brands on our website and in our Boxpark boutique. Soon followed by French brand, Maison Close. We started to bring in our AW'14 collection, including our Jackie set! We were really happy with the lookbook for this collection too, as it was quite different from our previous ones with it's minimal, 60's feel. As we work a year ahead, we shot our SS'15 lookbook in May of this year. This allows us to take the collection to tradeshows and show our stockists what we will have available for the next year. Many stockists plan their next seasons based on pre-orders they place at trade-shows. Here's our model Laura with her "bodyguards", our makeup artist Cheyenne and hair stylist Dee! This year marked our 10th birthday, and we wanted to celebrate in style! Emma, designer and creator of Playful Promises, planned and organised an extra-special collection to be manufactured in the UK. We teamed up with artist Karina Akopyan for a special print featuring an exclusive circus illustration (photo on the left), theming the entire project around vintage circuses. The result featured gold fringing, bodysuits, bra sets and more, each a new style for Playful Promises. Each piece is an incredibly limited edition, and once they are gone, they are gone! We said hello to Mia, another F Cup set featuring an exclusive print designed in-house and detachable suspender straps! We had a fabulous time at the London Fashion Week Catwalk Edit show! We began stocking makeup from Sugarpill and Shien Cosmetics! We shot a new Halloween lookbook inspired by Victorian Spiritualism, which mixed and matched pieces available at Playful Promises. We took part in the Lingerie Secret Santa campaign, with fellow independent designers! This box of goodies went off to our secret santa all the way in the US, Clare Bare. We shot our AW'15 collection with some of our favourite models, Miss Miranda, Miss Deadly Red and Veanne (IMM)! We are SO excited about this collection, which should be arriving from April onwards! The stunning retro-inspired Brigitte arrived, as the final part of our AW14 collection. The first part of our Spring/Summer 2015 collection, Gwendolene, has just arrived! We've got so much planned already for 2015, and so excited to be able to show you what we've been working on! We here at PP just love ourselves some colourful pants, and we thought we'd bring in the Spring with some eye-popping shades! I love how colour evokes all different feelings and memories, and our Neon Pink Nancy set is certainly eye-catching. Pink is typically a girly colour, but I find the pop of neon and the contrasting black details is quite commanding! What does our Neon Pink Nancy set remind you of? 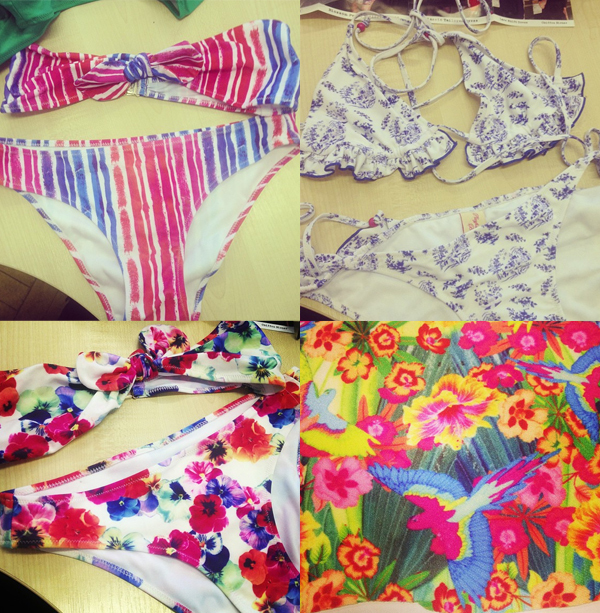 It's that time of year when our swimwear and lingerie samples are being prepared, ready to shoot next year's lookbook! We've already shot our AW13 collection (part of which will be arriving in late July), and now it's on to the colourful fun of Swim/Lingerie SS14. The above 4 images give you a sneaky look at some of our swimwear for next year - which print is your favourite? And here's a little teaser of our SS14 lingerie collection! Keep an eye on our instagram (@playfulpromises) for more sneaky previews!